Vitamin D refers to a group of fat-soluble secosteroids (Vitamin D1, D2, D3, D4, and D5). The two main forms of Vitamin D are ergocalciferol – Vitamin D2, and cholecalciferol – Vitamin D3. The main source of Vitamin D in the human body is the synthesis. It is synthesized in the skin from cholesterol, via chemical reaction dependent on sun exposure (UVB radiation). The necessary amount of Vitamin D can be produced by human organism with 5–30 minutes sun exposure twice per week to the face, legs and arms. Vitamin D is present naturally in a limited number of foods. It is commonly added in some manufactured foods, like juices, energy bars, protein beverages, cheese, infant formulas, cereals, milk. Vitamin D2 occurs naturally in mushrooms exposed to UV light. 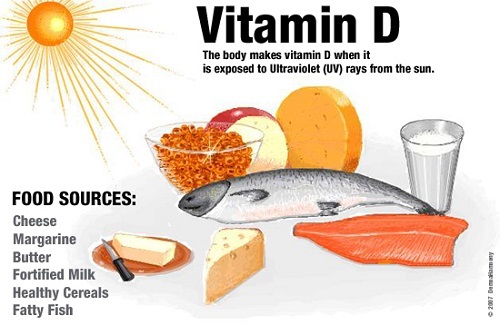 Vitamin D3 occurs in lichen, fish liver oils, some fish species (salmon, mackerel, tuna, sardines), egg yolk, beef liver. The synthesized or taken by food Vitamin D is biologically inactive. It is activated in the liver and kidney, by enzymatic conversion. The activated Vitamin D circulates in the blood. Its main role is to regulate the concentration of Magnesium, Calcium, and Phosphate, and to promote the healthy bone system. It has a neuromuscular, immune and anti-inflammatory function and influences the cell growth. Vitamin D deficiency leads to bone-softening diseases (osteomalacia in adults and rickets in children). Vitamin D hypervitaminosis is rare and leads to hypercalcemia. If it is not treated, hypercalcemia can result in deposits of Calcium in soft organs and tissues. The overdose cannot result from exposure to sunlight. The recommended daily intake of Vitamin D is from 5 to 15 µg/day, depending on the age. Calcium is a chemical element, a reactive alkaline earth metal. It has silver, and in a very pure state – orange color. It is the fifth most common element and the most common metal in the human body. In the nature Calcium exists as a mixture of stable isotopes (40Ca, 42Ca, 43Ca, 44Ca, 46Ca, and 48Ca). It most often occurs in the form of Calcium carbonate. The Calcium, due to its high reactivity, does not have many applications. It can be used as an alloying component in steelmaking. However, the Calcium compounds are widely used in different industries: in pharmaceuticals and foods for Calcium supplementation, in cement and paper industry, in car batteries, as electrical insulators, etc. In the human body, the Calcium plays a vital role in the biochemistry and physiology. In the cells, it plays an important role in signal transduction pathways, neurons’ neurotransmitter release, muscle contraction, and fertilization. It is an important cofactor for many enzymes. Outside the cells, Calcium is important for the proper bone formation and for the maintenance of the potential difference across the cell membranes. Calcium is vital to the health of the circulatory, muscular, and digestive systems. It is compulsory for the building of the bone system and supports function and synthesis of the blood cells. The Calcium in the body is obtained with food. The main part of the Calcium is obtained from grains and dairy products, other sources are fruits, vegetables, sugar, protein-rich foods, oil, and fats. Vitamin D and parathyroid hormone allow and enhance the deposition of Calcium ions in the bones. Insufficient quantities of Calcium in the body may lead to osteoporosis and osteomalacia. Excessive Calcium intake may cause hypercalcemia, resulting in deposits of Calcium in soft organs and tissues. However, this condition is most likely to result from Vitamin D or parathyroid hormone excess. The recommended daily intake of Calcium is 800-1300 mg, depending on the age. Vitamin D: Vitamin D refers to a group of fat-soluble secosteroids (Vitamin D1, D2, D3, D4, and D5). The two main forms of Vitamin D are ergocalciferol – Vitamin D2, and cholecalciferol – Vitamin D3. Calcium: Calcium is a chemical element, a reactive alkaline earth metal with silver and in a very pure state – orange color. In the nature Calcium exists as a mixture of stable isotopes (40Ca, 42Ca, 43Ca, 44Ca, 46Ca, and 48Ca). Vitamin D: Vitamin D regulates the concentration of Magnesium, Calcium, and Phosphate and promotes the healthy bone system. It has a neuromuscular, immune and anti-inflammatory function. It influences cell growth. Calcium: In the cells Calcium plays an important role in signal transduction pathways, neurons’ neurotransmitter release, muscle contraction, fertilization. It is a cofactor for many enzymes. Outside the cells Calcium is important for the proper bone formation and for the maintenance of the potential difference across the cell membranes. Calcium is vital to the health of the circulatory, muscular, and digestive systems. It is compulsory for the building of the bone system, supports function and synthesis of the blood cells. Vitamin D: Vitamin D can be synthesized in the body and supplemented. Calcium: Calcium in the body needs to be supplemented. Vitamin D: Vitamin D2 occurs naturally in mushrooms exposed to UV light. Vitamin D3 occurs in lichen, fish liver oils, some fish species (salmon, mackerel, tuna, sardines), egg yolk, beef liver. 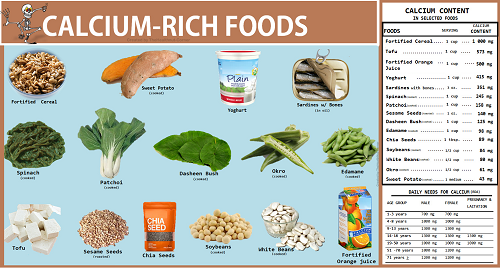 Calcium: Calcium occurs in grains, dairy products, fruits, vegetables, sugar, protein-rich foods, oil, and fats. Calcium: The recommended daily intake of Calcium is 800-1300 mg, depending on the age. Vitamin D: The recommended daily intake of Vitamin D is from 5 to 15 µg/day, depending on the age. Vitamin D refers to a group of fat-soluble secosteroids (Vitamin D1, D2, D3, D4, and D5). The two main forms of Vitamin D are Vitamin D2 and Vitamin D3. Calcium is a chemical element, a reactive alkaline earth metal with silver and in a very pure state – orange color. In the nature Calcium exists as a mixture of stable isotopes (40Ca, 42Ca, 43Ca, 44Ca, 46Ca, and 48Ca). Vitamin D regulates the concentration of Magnesium, Calcium, and Phosphate; promotes the healthy bone system; has a neuromuscular, immune and anti-inflammatory function; influences cell growth. Calcium plays an important role in signal transduction pathways, neurons’ neurotransmitter release, muscle contraction, fertilization; it is a cofactor for many enzymes. Outside the cells it is important for the proper bone formation and for the maintenance of the potential difference across the cell membranes. Calcium is vital to the health of the circulatory, muscular, and digestive systems; it is compulsory for the building of the bone system; supports function and synthesis of the blood cells. Vitamin D can be synthesized in the body and supplemented. Calcium needs to be supplemented. Vitamin D2 occurs naturally in mushrooms exposed to UV light. Vitamin D3 occurs in lichen, fish liver oils, some fish species (salmon, mackerel, tuna, sardines), egg yolk, beef liver. Calcium occurs in grains, dairy products, fruits, vegetables, sugar, protein-rich foods, oil, and fats. The recommended daily intake of Calcium is 800-1300 mg, depending on the age. The recommended daily intake of Vitamin D is from 5 to 15 µg/day, depending on the age. Vitamin D refers to a group of fat-soluble secosteroids. The two main forms of Vitamin D are Vitamin D2 and Vitamin D3. Its biological function is to regulate the concentration of Magnesium, Calcium, and Phosphate and to promote the healthy bone system. It has a neuromuscular, immune, anti-inflammatory function, and influences the cell growth. Calcium is a chemical element, a reactive alkaline earth metal with silver and in a very pure state – orange color. In the cells, it plays an important role in signal transduction pathways, neurons’ neurotransmitter release, muscle contraction, fertilization. It is a cofactor for many enzymes. Outside the cells, Calcium is important for the proper bone formation and for the maintenance of the potential difference across the cell membranes. It is vital to the health of the circulatory, muscular, and digestive systems; it supports function and synthesis of the blood cells. Insufficient quantities of and Vitamin D and Calcium in the body may lead to bone-softening diseases. Excessive intake of Vitamin D and Calcium may cause hypercalcemia, resulting in deposits of Calcium in soft organs and tissues. Dr. Mariam Bozhilova Forest Research Institute, BAS. "Difference Between Vitamin D and Calcium." DifferenceBetween.net. July 16, 2018 < http://www.differencebetween.net/science/health/difference-between-vitamin-d-and-calcium/ >. Feldman, D.,W. Pike, R. Bouillon, E. Giovannucci, D. Goltzman and M. Hewison. Vitamin D: Volume One: Biochemistry, Physiology and Diagnostics, Fourth Edition. Cambridge: Academic Press. 2017. Print. Ross, A., C. Taylor, A. Yaktine and H. Del Valle. Dietary Reference Intakes: Calcium. Vitamin D. Committee to Review Dietary Reference Intakes for Vitamin D and Calcium. Washington: The National Academies Press. 2011. Print.